Civil Society Organizations (CSO) are formal groups of citizens, which by acting between citizens, economy, and state, advocate for specific civic agendas. Since CSOs mainly engage in local communities, their participation tend to enhance and complement local representative system and increase participatory decision-making. Municipal development strategies refer to those ideas and practices that are formulated to promote and advance development of public administration structures, processes, and institutions at the local level according to the specific goals and values of stakeholders. The main purpose of citizen participation in government’s decision-making process is to strengthen democratic processes and, thus, provide substantial improvements to peoples’ lives. Participation of citizens and other social stakeholders in government affairs improves democratic capacity of the decision-making processes and facilitates meeting citizens’ demands. At the local government level, citizen participation is even more relevant due to the proximity of this form of government to citizens. Civil Society Organizations (CSO) are formal groups, which by acting between citizens, economy, and state, advocate for specific civic agendas. Since CSOs mainly engage in specific local communities, their participation at the municipal level tends to enhance and complement local representative system and increase participatory decision-making. Over the years, CSOs have contributed to strengthening and formalizing citizens’ participation in the local government processes mainly by facilitating interaction with citizens, and bringing in necessary expertise and experience. Strategic planning has often been used in the public sector, since public organizations cannot manage results in long or short term without well-developed capacity for strategic management. The strategic planning process at the municipality level is particularly suitable for a wide CSOs’ engagement and participation in local public administration affairs. Municipalities in Bosnia and Herzegovina have been applying the strategic planning methodology for a number of years. This process, initiated in the early 2000s, was designed to increase the transparency, inclusiveness, social accountability, and sustainability of municipal decision-making processes. Strong participation of CSOs in the process of development strategy formulation aims to ensure the creation of a joint development vision and an increase in the strategy acceptance level by the broad community. Bearing in mind all the benefits that citizen participation in policy- and decision-making processes brings, this entry explores the circumstances and possible factors that contribute to CSOs’ significance in the process of formulation of development strategies at the municipal level in the Federation of Bosnia and Herzegovina. Strategic planning in a municipal setting prescribes a systematic process, which enables a community leadership to understand numerous environmental facets that the community will face in the future. In addition, it establishes consensus on how to achieve the most desired vision, and illuminate actions that will most likely make that happen, all within the context of expected financial and human resources (Gordon 2005). In the United States of America, strategic planning at the municipal level has been in use for more than 20 years (Bryson 2010) and has been characterized by multiple success factors – local promotion of the process, the importance of starting the process with strategic thinking, and the importance of the environmental scan as an application of collective wisdom of participants in describing the future as clearly and comprehensively as possible (Gordon 2005). Research on the success of strategy implementation in 150 organizations in public sector in Canada has found that a planned and formal approach to a strategy enhances its implementation in bureaucratic public organizations. Moreover, it was recognized that formal planning has an indirect effect on strategy implementation due to the mediating role of managerial involvement and that public organizations can reap benefits from formal strategic planning in less stable and unstable environments (Elbanna et al. 2016). CSOs aggregate citizens’ interests and act as mediators in the state-society relations by communicating societal preferences to policy-makers. In a weak political context, participation of CSOs in the decision-making process can improve the efficiency of government’s services and help them connect with grassroots. The participation and contribution of nongovernmental organizations that regularly employ staff is more relevant to the political and democratic rather than economic development of a society. Having in mind that local development strategies focus not only on economic development but also combine social, spatial, and environmental development, the participation of nongovernmental organizations, and other CSOs should bring benefits to the process (Treib et al. 2007). The question of who should be involved in policymaking and implementation is a central question in public policy and public management. Civic participation contributes to policy implementation when state actors frequently include CSOs in the policy-making process. Readiness of governments to act in a participative manner is probably the key precondition for the participation of citizens and CSOs in decision-making processes. The governments must want to seek participation as much as the participants want to give it, and citizens are less likely to participate if the political environment is not positive and acceptive of input. In BiH, CSOs or associations (the official term) get registered either at state, entity, or cantonal levels, which is regulated by the Law on Associations and Foundations of BiH. CSOs in BiH mostly focus on meeting demands of their members and less on acting for public good. A study on participation of CSOs in the process of development strategies formulation at the municipal level in the Central Bosnia Canton (CBC) in the FBiH has shown that only about a third of surveyed CSOs have participated in the process. This is to an extent reflected in the perception of CSOs by BiH citizens and of their ability to resolve issues of common concern. Namely, it was detected that 70.3% of citizens of BiH do not see CSOs as being in a position to resolve local issues (Puhalo and Vukojević 2015). Over the last 15 years, many municipalities in Bosnia and Herzegovina have initiated and established mechanisms for the formulation of municipal development strategies. In those endeavors, municipalities have been supported and assisted by different organizations and agencies. These organizations have advocated for integrated development planning, or planning based on respect for human rights, which rely on the premise that proper local municipal development planning includes a strong citizens’ participation component. The purpose of development strategies formulation, as the municipalities have seen it, has been the creation of an environment for development planning by relying on local capacities and resources. In March 2017, the FBiH Parliament adopted the Law on Planning and Management of Development in the Federation BiH. The purpose of this law is to establish a system for development planning and management of development at the level of the FBiH, cantons, and municipalities. Pursuant to this law, municipalities are obliged to formulate their development strategies, participate in the formulation of strategic documents at the cantonal level, ensure a harmonized approach to local budget planning, and coordinate the process of monitoring, evaluation, and reporting on the implementation of their strategies. According to this law, municipal development strategies in the FBiH should fit the framework set by the FBiH and cantonal strategies. This study is primarily interested in a design and testing of a theoretical model of CSOs’ relevance within a process of development strategies formulation at the municipality level. The proposed model has to be founded on the existing literature and, at the same time, applicable to the idiosyncratic political, economic, and society conditions of the FBiH. H1: The organizational context has a direct and positive impact on organizational relevance in the development strategies formulation processes. H2: The CSO’s proficiency has a direct and positive impact on organizational relevance in the development strategies formulation processes. H3: The organizational context has a direct and positive impact on CSO’s proficiency. These three hypotheses determine the theoretical (conceptual) model related to the CSO’s relevance within the process of development strategies formulation, which is graphically presented in Fig. 1 (bold text). “Project Portfolio” (Y6) – their effectiveness in the project implementation rate, i.e., based on the number of projects implemented during the time-period from 2009 to 2013. To test the hypothesized model, the partial least squares structural equation modeling (PLS-SEM) was employed. For that purpose, an appropriate survey questionnaire was developed and sent to 300 CSOs from the Central Bosnia Canton (CBC). A total of 117 responses (39%) were received, out of which 43 were valid, that is, the 43 responding CSOs have participated in a process of formulating development strategies at the municipality level. The responding CSOs are proportionally distributed among different categories and different municipalities from the CBC. Initial model testing showed a problem with the convergent validity of indicator X1 (“Total Budget”). Namely, the outer loading of this indicator was statistically insignificant, so this indicator was removed from the model. The resulting path model is shown in Fig. 1. Evaluation of the measurement model was made through a set of three tests – model reliability, convergent validity, and discriminant validity. All model indicators are of expected size and direction and are statistically significant (Fig. 1), which provides for the indicators reliability. In addition, the obtained values for the average variance extracted (AVE) show that each construct explains, on average, more than a half of the variance of corresponding indicators. Combining these two results together, it could be concluded that the convergent validity for the model was met. The high composite reliability (ρc) values for all constructs (Fig. 1) point that indicators of each construct reliably measure that same construct. Finally, all AVE estimates for the model’s constructs are greater than the squared inter-construct correlations, which indicates that there are no problems with discriminant validity (constructs are truly mutually distinct). The first step in structural model evaluation is assessment of the coefficients of determination (R2 values) of endogenous constructs. The R2 value of the construct F3 can be considered as moderate, while that of the construct F2 as weak (Fig. 1). In addition, the effect sizes (f 2) that construct F1 has on constructs F2 and F3 are small, while the effect size of construct F2 on construct F3 is large (Table 1). The last step in structural model assessment is the examination of structural path estimates (Table 1). It could be seen that only one structural path estimate, that between the constructs F2 and F3, is statistically significant and in the predicted direction. The paths between constructs F1 and F2, as well as between F1 and F3, are statistically insignificant (p > 0.05). The measurement model testing has obtained the results that indicate a very good fit between the model and the reality represented by the data. A very interesting point here was the fact that the indicator related to the total budget of CSOs has been found to be statistically insignificant, even though in an expected direction. Such a finding may be a proof of constant CSOs’ struggle for funding, but it can also be a result of the respondents’ reluctance to reveal the true financial resources of the organizations. The results of the specified structural model testing provide for a reliable structural path analysis and, consequently, testing of proposed hypotheses. Furthermore, the value of coefficient of determination for the endogenous construct F3 – “Relevance,” along with the value of predictive relevance indicator (Q2) above zero and large effect size, implies rather high predictive (and explanatory) power of the proposed model. The results of the structural paths evaluation (Table 1) show that estimations for the structural path between constructs F1 and F2, as well as between constructs F1 and F3, are both statistically insignificant, while the structural path between constructs F2 and F3 is statistically significant and in the expected direction. This means that the model does not support the hypotheses H1 and H3, while it fully supports the hypothesis H2. More specifically, organizational proficiency is a strong predictor of CSO’s relevance in the development strategies formulation processes at the municipality level. At the same time, the organizational context (i.e., CSOs’ strength and influence potential) is not a significant predictor of either the organizational proficiency or its relevance in the development strategies formulation processes. These results unequivocally suggest that organizational proficiency is just that particular trait that makes the difference between CSO’s relevance and irrelevance. Activity-specific knowledge and skills, readiness to participate in the process under different conditions and to collaborate with heterogeneous parties are those specific organizational properties that increase its visibility and, consequently, relevance in the wider context. Thus, investing in and strengthening those organizational values and characteristics will improve and secure organizational results and accomplishments. Another very interesting finding is that situational characteristics of the CSOs have no significant impact on both organizational proficiency and relevance. 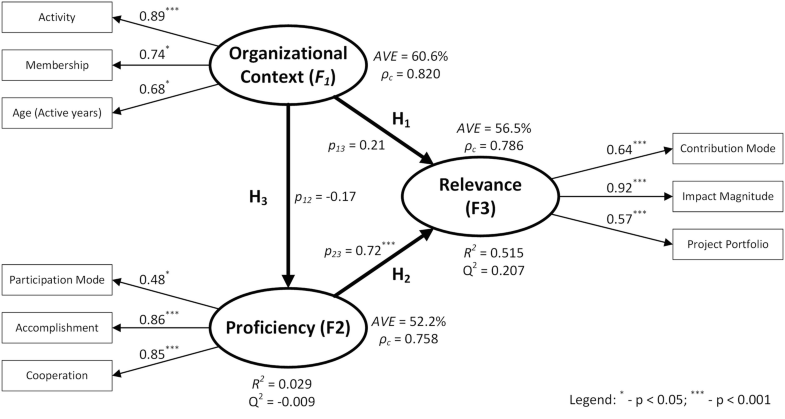 While the age and size may potentially increase organizational inertia and arrogance, which in effect may even have a negative impact on organizational competencies and capabilities, it is somewhat surprising that the same characteristics have no significant impact on the organizational relevance at the municipality level. Finally, combining all these findings, it can be concluded that the CSOs need to relentlessly reinforce their proficiency, i.e., their professional competences and capabilities. Only that may ensure broad relevance to the CSO within its community and, possibly, wider. Size and strength are desirable traits, but of a rather secondary significance. This is another proof of how soft and intangible organizational resources are more valuable than the tangible ones. Just like in a famous proverb – brain is better than brawn. It is widely accepted that the participation of citizens and CSOs in government’s decision-making processes strengthens its accountability and facilitates implementation of decisions adopted in such a fashion. Likewise, the application of strategic planning in the public sector increases the number of opportunities and the extent of public participation, including CSOs, and increases the number of projects, outputs, and development activities in a community. The study found that the greater specific knowledge and participative skills of CSOs, as well as the greater degree of self-content with the outcome of participation, and the greater acceptance by other parties in the process, result in the greater likelihood that CSOs become more relevant in the process of formulation of development strategies. In addition, the same traits increase the efficiency of CSOs’ project portfolio. These findings show that both municipalities and CSOs are at an advantage when they reinforce cooperation and mutual ties. Municipalities increase the significance and participatory aspect of the process of formulation of development strategies by involving more relevant representatives of the local civic sector. CSOs, on the other hand, develop their participative capacities, which is not only compensated by a greater content and collaboration capacity, but also improves the rate of project’s implementation.